[291 Pages Report] The major factors driving the demand of automotive occupant sensing system and whiplash protection system are stringent safety norms, increased safety awareness, technological advancement, affordability as well as institutions such as the New Car Assessment Program (NCAP) awarding safety ratings to cars based on safety performance. In the coming years, the increasing demand for premium or luxury cars in the regions such as Europe and Asia Pacific, mainly in China, India and Japan, is expected to drive the market. Sustainable growth in the occupant sensing system and whiplash protection system market will largely depend upon upcoming legislations in various countries and growing global vehicle sales. Car makers are also focusing on the other passive safety systems like occupant sensing and whiplash protection to prevent whiplash in case of rear-end collisions. The report classifies and defines the automotive occupant sensing system and whiplash protection system market in terms of volume and value. This report provides comprehensive analysis and insights on occupant sensing system and whiplash protection system market (both - qualitative and quantitative). The report highlights potential growth opportunities in the coming years as well as it covers review of the - market drivers, restraints, growth indicators, challenges, legislation trends, market dynamics, competitive landscape, and other key aspects w.r.t. automotive active safety systems market. The key players in the automotive occupant sensing system and whiplash protection system market have also been identified and profiled. The report covers the market of automotive occupant sensing system and whiplash protection system in terms of volume and value. Market size in terms of volume is provided from 2011 to 2019 in thousand units, whereas the value of the market is provided in $millions. The automotive occupant sensing system and whiplash protection system market is broadly classified by geography (Asia-Pacific, Europe, North America and RoW), focusing on key countries in each region. 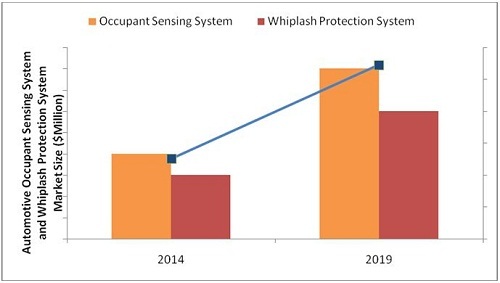 The occupant sensing system market in terms of value is projected to grow $1.6 Billion and whiplash protection system market to grow $2.1 Billion by 2019 at a healthy CAGR of 14.3% and 13.8% respectively from 2014 to 2019. Automotive safety systems have become advanced, sophisticated, and efficient over a period of time. Today, automotive industry is more inclined towards the use of advanced technologies to reduce number of accidents and mitigate the impact of accidents on occupants. Automotive safety systems have played an important role in achieving these targets, where these systems have made vehicles safer for the occupants. The recent rise in the attitude of the governments and consumers towards safety attributes of vehicles is one of the major drivers for the automotive safety system market. Automotive passive safety systems have evolved from seatbelts and airbags to occupant sensing and other efficient automotive passive safety systems. These transitions took place due to several reasons; the increasing concern of consumers towards safety and their increasing willingness to pay for occupant safety, constantly updated rating system of organizations like New Car Assessment Program (NCAP) and highly competitive market made companies to do extensive R&D work. Automotive passive safety systems are growing at a significant rate in Asia-Pacific and the ROW regions because of the increase in their purchasing power, high standard of living, growing GDP rate, increase in government’s regulatory actions for safety and growing vehicle sales. However, North America has the highest market share in the global occupant sensing market and Asia-Pacific has the highest market share in the global whiplash protection system market. Developing countries like India, China, Russia, Brazil, and Mexico are expected to have high growth rate in the demand for automotive occupant sensing system and whiplash protection system from 2014 to 2019. The global automotive occupant sensing system and whiplash protection system market is dominated by a few top players such as Robert Bosch (Germany), Autoliv Inc. (Sweden), Continental AG (Germany), Takata Corporation (Japan), and Delphi Automotive PLC (U.K.). 8.5.1 Opportunity Analysis for U.S.
8.5.6 Opportunity Analysis for U.K.
10.8 Hyundai Mobis Co., Ltd.
10.9 Key Safety Systems Inc. Figure 41 SWOT Analysis for Autoliv, Inc. Figure 47 SWOT Analysis for Hyubdaimobis Co., Ltd. Figure 48 SWOT Analysis for Key Safety Systems Inc.